Identity can be a killer, especially to fifteen year-old Justus Appleyard. No one seems to be who they really are — even Justus himself. A typical teenager at war with everything, normal will never be the same for Justus after three unusual people move into the abandoned house next door and barge into his life. Enter an obese giantess named June with an obsession for mall food and her so-called son, Apollo, and daughter, Diana. 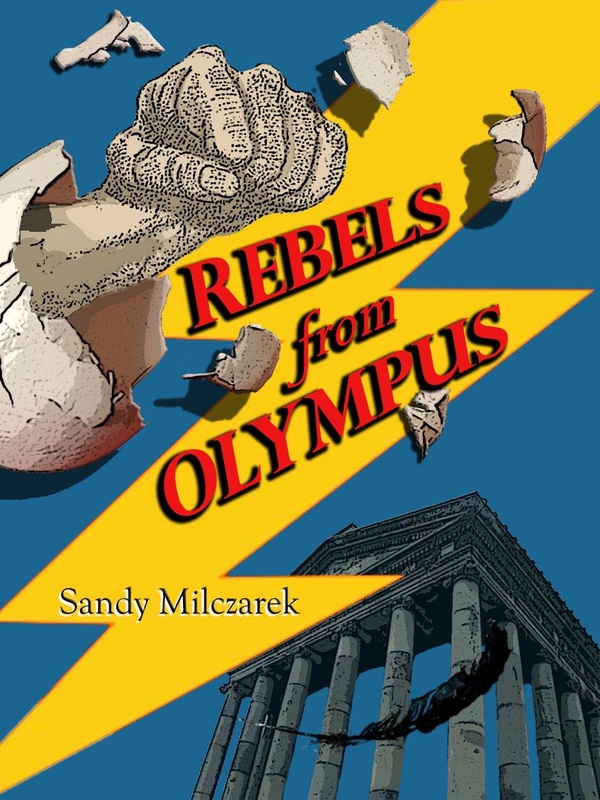 Once their divinity is revealed as rebellious gods on the lam from Mount Olympus, the adventure ramps up as an egg-shaped lake and an ancient Native American serpent mound must be saved from destruction. An eccentric mother, an oddball thirteen year- old sister, Rosa, with an uncanny ability to design and make clothing, and Justus’ love interest, Madeline, join Justus on his divine escapades. Secret identities are revealed, new connections made, and Justus finds the strength and talents within himself to juggle every conflict thrown his way. Look for its release in both e-book and print the fall of 2015 on your favorite bookstore website. I’m currently writing the sequel to Rebels from Olympus, The Rebel’s Call, due to release next year. I am back working at the Waldorf School in the front office and just discovered your book in the library. I haven’t checked with Taye yet to see how it got there but was thrilled to see you have accomplished a life-long dream. I can’t wait to read it. Amazing!! Hi, Laura! It’s so great to hear from you! I participate in the Threefold Pittsburgh group with Taye, Rosemary and Melissa, so I’ve shared my book with them. I gave a copy to Taye for the school library. I actually can’t believe I managed to pull this book off, it only took me 13 years to write. I’m working on the sequel now, which won’t take so long now that I’ve got the hang of it. Hope all is well with you, your kids and the school. Thank you so much for your comment, Angelica. My son attended the Waldorf School of Pittsburgh K through 5th grade, and I was always looking for books for him that also brought at least some spiritual content into it without being “preachy”, but showing strong young people learning how to handle problems on their own terms and growing through the experience. I purposely wrote the main protagonist as male, because many boys won’t read the book otherwise. I made sure that his sister was more than his match with her very strong will. I hope you enjoy the novel!